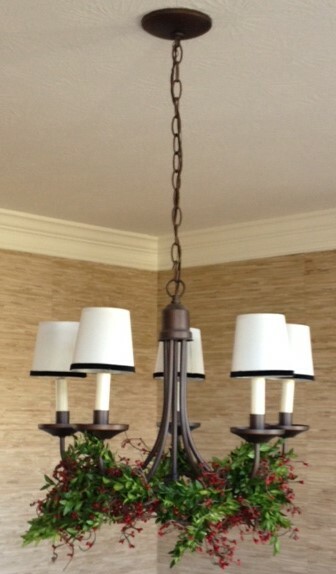 This plain chandelier needs a little sprucing up for the holidays. Here are the supplies you will need. Purchase as many shades as your fixture requires. Simple! Apply the fabric adhesive in small amounts and work you way around the shade. This allows you to better control how the ribbon is applied. Apply the velvet trim starting at the shade seam. Smooth it as you work your way around the shade so there are no bumps. Continue working around the shade until the two pieces meet. Carefully trim any excess. Press firmly at the seams for a good hold. That’s it! 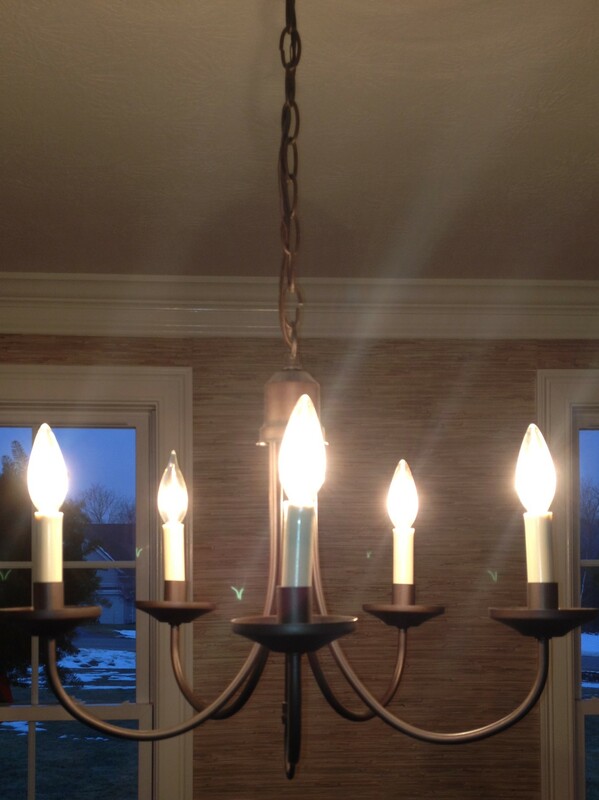 Here is the completed chandelier shade with black velvet trim at the bottom. For a little extra holiday feel, I wrapped a berry and twig garland around and added some fresh boxwood. A simple, inexpensive and easy DIY project you can complete in about an hour! What more can you ask! The finished project! A berry and twig garland was wrapped around the base of the light and fresh boxwood sprigs are woven into it. Berry, twig and boxwood garland accent the new velvet trimmed shades and complete the holiday dressing! I hope you enjoyed this DIY holiday project! I love this time of year and decorating for the holidays! The visual transformation in my home puts me in the holiday spirit. For a few short weeks, we bring trees into our homes, display collections of snowmen, Santas, elves, serious or silly decorations and enjoy every minute of it. It really is an opportunity to Design*Decorate*Delight in the fun of it all! I wish you the happiest of holidays!! Take some time to push aside all the hectic, craziness these few weeks add to our lives, and remember to enjoy the people you share the holidays with! 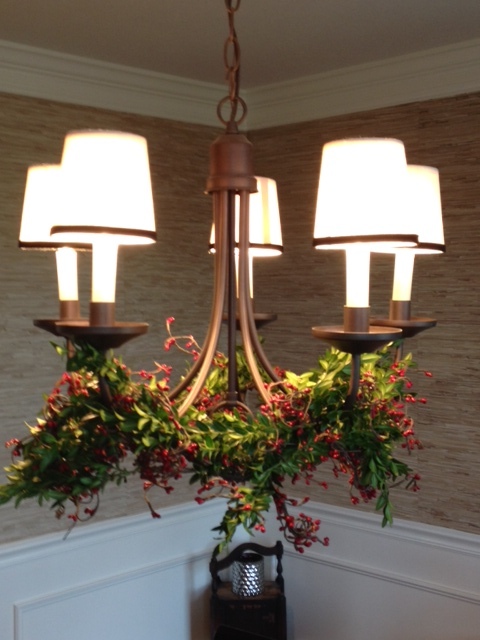 Gallery | This entry was posted in Holiday decorating and tagged berry twig garland, boxwood decor, chandelier shade trims, christmas diy projects, DIY holiday ideas, DIY projects, holiday chandelier, holiday decorating. Bookmark the permalink.